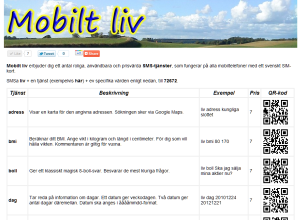 Mobile Life (“Mobilt liv”) provides a range of fun and useful SMS services for everyday use, including information requests and location services. The service has been offered to Swedish mobile phone users, but could easily be adapted to other regions through translation and adaptation to different SMS providers. It was specified and implemented by Abiro during 2009. The service is no longer active.